Stitches: ch, picot, sc, sl st.
Picot: Ch3, sl st in 3rd ch. R1: Ch6, Sc in 2nd ch from hook. R2: Ch1, turn. Sc in same st.
R3: Ch1, turn. Sc in ea sc and in ea ch1 sp. Rep R2 & R3, 11 times. Ch1, do not turn. Sc in same sp. and one through the ch1 sps on the right side of the bookmark. Cut another length of yarn about 20". 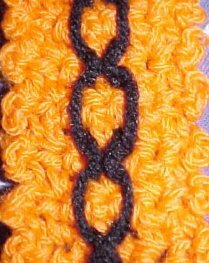 Tie a knot at both ends of the bookmark.